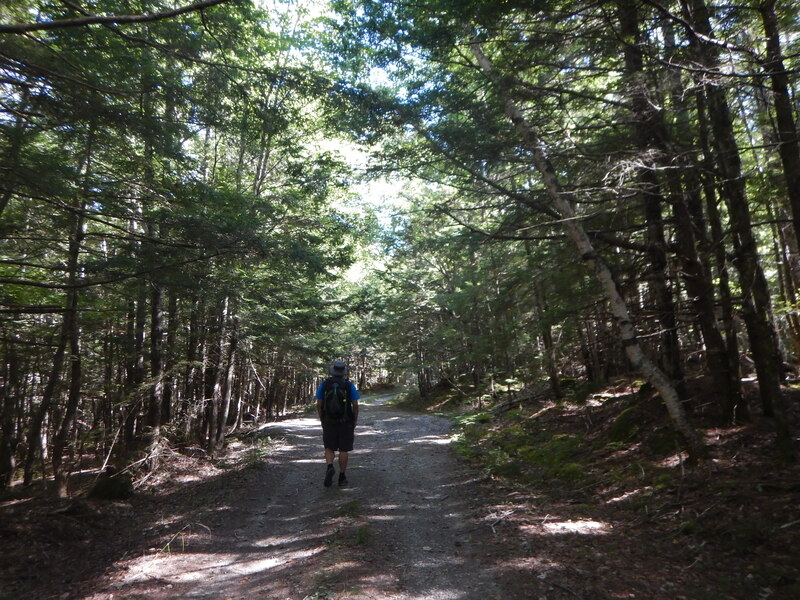 Nova Scotia is woefully short on established backpacking routes. Kejimkujik National Park and National Historic Site, or “Keji”, is the only option in the southwestern part of the province. Their flagship route is the “Liberty Loop“. Keji holds duel designation as a National Park and National Historic Site because of its connection to the Mi’kmaw culture. It contains magnificent old growth hemlock stands and beautiful lakes and streams. The park is located in the Southwest Nova Biosphere Reserve, designated by UNESCO in 2001, and is also a dark sky preserve. Keji has hugely popular frontcountry camping and a variety of wonderful backcountry canoe tripping opportunities. There are also shorter backpacking options which are great for a night or two away. That said, the huge majority of Keji’s frontcountry and backcountry sites fill within hours of registration opening each year. Because of the early bookings, there are frequent last-minute cancellations so it’s advisable to keep an eye out if your schedule is flexible. Liberty Loop’s main claim to fame is its length, at 60.5km. The downside is that it isn’t actually a loop, but more of a c-shape. Most people hike between Big Dam and Eel Weir parking lots. If you don’t want to bring two cars or walk the extra approximate 17km on mostly paved roads, shuttle services are available from Whynot Adventures (located right in the park). Much of the backcountry portion of Liberty Loop is actually double track, in places more like road than trail. The route is quite flat and doesn’t add much in the way of views beyond what you would experience on a shorter loop around Big Dam Lake and the frontcountry trails, though you do get to see lakes which are otherwise only accessible by canoe. On the plus side, Keji’s backcountry campsites are great. They each have 2 large flat tent pads, large picnic table and firebox, supplied firewood, ingeniously simple to use bear hang cable system, and outhouse (with toilet paper supplied, though it’s always good to bring some just in case). Pictures of all of the campsites are available on Keji’s reservation website. They all have a nearby water source, though the lake sources can be rather full of floating organic matter and/or covered with floating pollen depending on the timing of your trip. It’s always a good idea to bring a pre-filter (even a clean nylon can help extend the life of your filter or make chemical treatment more effective). Most of the water in this area is high in tannins which makes it dark in colour, but it generally tastes quite good. Information about the route is scattered between the official park website, and the Friends of Keji Cooperating Association. The trail is marked but it’s advised that you carry a copy of the map/backcountry guide, which can be purchased from the Visitor Centre when you arrive. It’s also available at MEC in Halifax or online if you want to pick it up in advance. So, despite the fact that we’d already done the shorter Big Dam backpacking loop (recommended! ), and had canoed through the area (highly recommended! ), and are not fans of road-walking in general, we decided to check the Liberty Loop anyway. We wouldn’t normally spend 4 nights on a trip of this length/difficulty, but we had the time free and figured it would be a relaxing trip. We ended up bringing two cars and leaving one at the Eel Weir parking lot (red arrow on the map below). We then drove around to the Big Dam parking lot (green arrow) to start the trip. We coudn’t get our first choice of campsites, but ended up at 44, 42, 41, and 28. We had wanted to stay at site 22 to check out the extra section of trail, but it was fully booked. 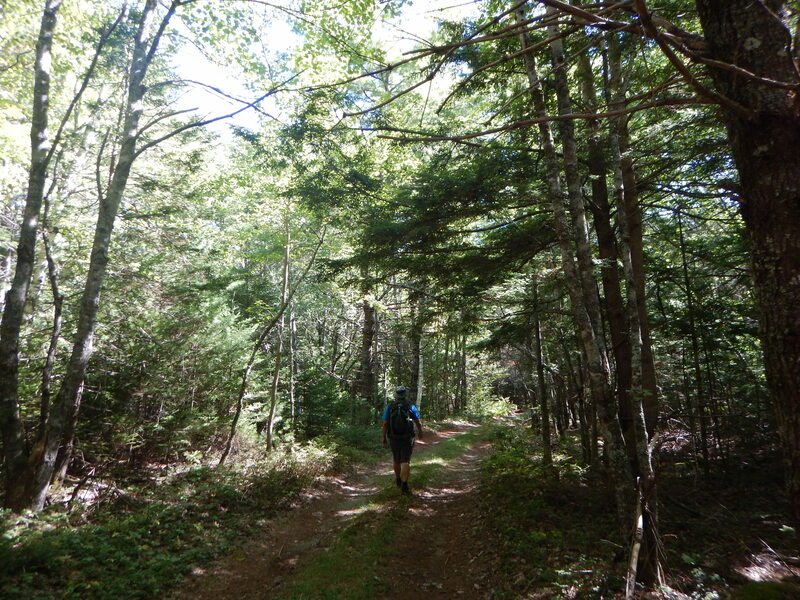 Shortly after leaving the Big Dam parking lot you have the option to walk through the “Hemlocks and Hardwoods” loop. It’s well worth the few extra steps to see ancient hemlocks. Soon after, you reach a warning sign indicating you are entering the back-country. Though there are part of this trail that feel like backcountry, large sections follow the ATV access used to bring firewood in to the sites in this area. It is a lovely view where the trail reaches the tip of Frozen Ocean Lake. From here you would turn left to do the smaller loop back around Big Dam Lake or turn right to stay on the Liberty Loop. It’s a nice walk along the north shore of Frozen Ocean Lake. Our first night was at site 44, which is located along a clear brook. The trail goes right through the middle of the site (one funny characteristic of some of Keji’s backcountry sites). The wooden structure visible at the far left of the photo is actually the bridge over the creek. That said, there is very little foot traffic so it’s not an issue unless you are looking for more privacy, which you can find at some of the other sites. From here the trail became much more overgrown in places, though we could follow it with no problems. Night two was at campsite 42. Site 42 is along the shore of Liberty Lake. Past site 42 the trail enters a more boggy/marshy area where it’s important to stay on trail. Fortunately this sign pointed us in the right direction at the only spot where we might have had a question. There is lovely forest along this section, which is the last of the single track trail. Here is our tent sent up at site 41 for our third night. It’s a lovely site, set back off the trail with just a short walk to a bridge over the brook leading to Peskawa Lake. The next morning, we set out on the widening trail. The trail takes you right past Mason’s cabin. Actually you pass two cabins, but we didn’t take a picture of the second one as there was a group of hikers sitting out front. We were intrigued by these old signs. Lots of history in this park. Obviously this section had been open to vehicles at some point, based on this old speed limit sign peeking out between the trees. Site 28 is also neat. It’s located up on a hill above the trail, just above another brook. From site 28, it was just a short walk back to the car in the morning. Here the trail passes signs denoting a scientific burn area. And shortly after, here is Wade on the bridge at Eel Weir, just around the corner from the parking lot. If the other pictures didn’t give it away, water levels were incredibly low at this time. We were happy to have finally made the trip around the loop, but frustrated that there is so much road walking on what is billed as a backcountry wilderness loop. That said, the open trail with very little elevation change is a good opportunity for backpackers looking to try out a longer trip or increase their daily mileage.